I can’t say that I’ve ever used a vintage (read: anything before 1970) domestic sewing machine that I didn’t like. A few have needed a little cleaning/tune-up, but 50 or so years ago, the manual simplicity of sewing machines was perfect in so many ways. Modern sewing machines have been cluttered with unnecessary stitches and too many automated “short-cut” features that tend to get in the way if you’ve moved beyond the basics of sewing. Sometimes, I wonder if society’s need for instant results has caused sewing machine manufacturers to design machines that operate like a microwave – just load your fabric & thread, push a few buttons, sit back, and wait for the machine to stop. Ding! Now you have a new [insert craft item]! And don’t get me started about computerized sewing machines! I absolutely HATE them! Do NOT put a brain in my machine. *Ahem* Okay, mini-rant over. Recently, I’ve even seen some interesting prototypes for new types of sewing machines like Sue and Alto. The “redesigns” might attract people new to sewing, but I know that I would be cursing and throwing the concept machines across the room – probably in a display something like this. Please don’t reinvent the “wheel” – just start building machines like they did mid-20th century! One feature I prefer, but isn’t a must, is a drop-in bobbin. I really like being able to check the bobbin thread level when I’m in the middle of a seam. For obvious reasons, I’ve been doing some sewing machine shopping this past week. I have an old Singer Genie from the 1970s as my backup machine but I’ve never really needed it before now. 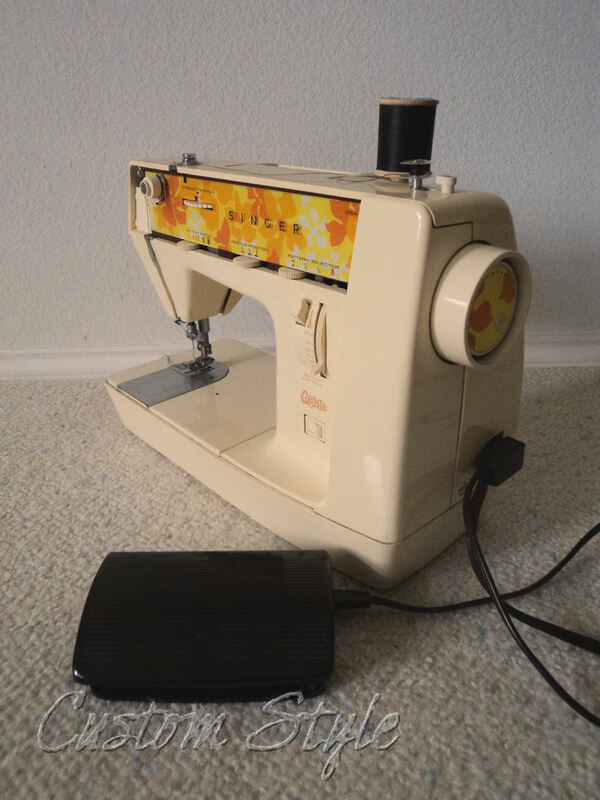 I purchased it years ago out of nostalgia because it is the same model on which I learned to sew (and my mom still pulls hers out when she needs it). In true Seventies style, it even has fun orange & yellow flowers on it! When I had to pull the Genie out for a couple weeks ago, it was interesting. The sound of its mechanics really took me back. It has a different hum than any other machine (it’s more like a whir) and the pedal has a creaking that kind of sounds like a duck. 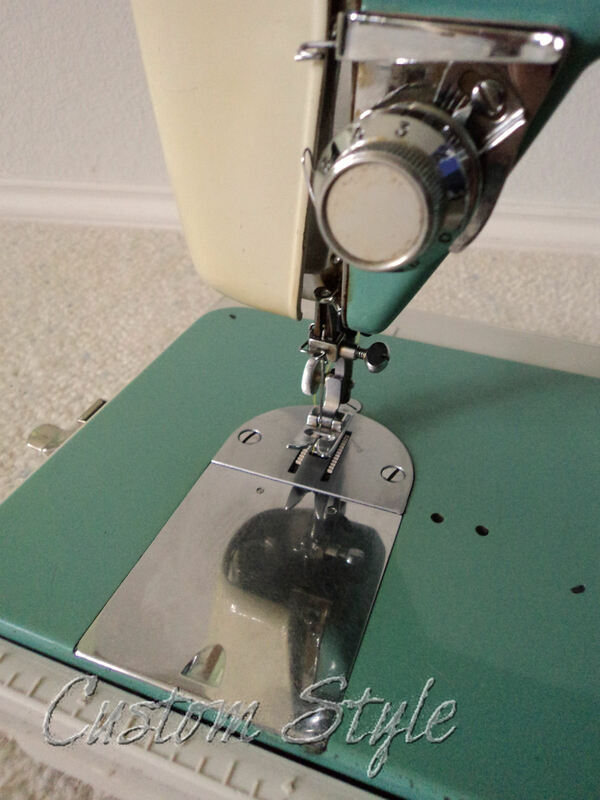 The Genie serves its purpose just fine – you just won’t enjoy sewing on it for hours at a time. So it was clear that I had to buy a new machine when I learned my main sewing machine was shot. At first, I considered buying an industrial, and then getting a cheapy basic portable machine that I could consider disposable. But I really want something portable that I’m not afraid will break in the middle of a major stitching job like the Nike commercial. I narrowed my search results down to 6 machines pretty fast. Two were industrials and four were vintage domestic machines. There were only two geographically close machines – at least one of the domestics was about a 3-hour drive away. Based only on photos and vague descriptions, my top choice was a brand I’ve never heard of before now: Wizard. This was the only photo listed and the title of the ad was “Vintage Wizard Zig Zag Sewing Machine”. My first thought upon seeing the photo was “Oh, my gosh, it’s a Cadillac!” It just plain looks like a classic car with its vintage teal & cream with chrome trim. 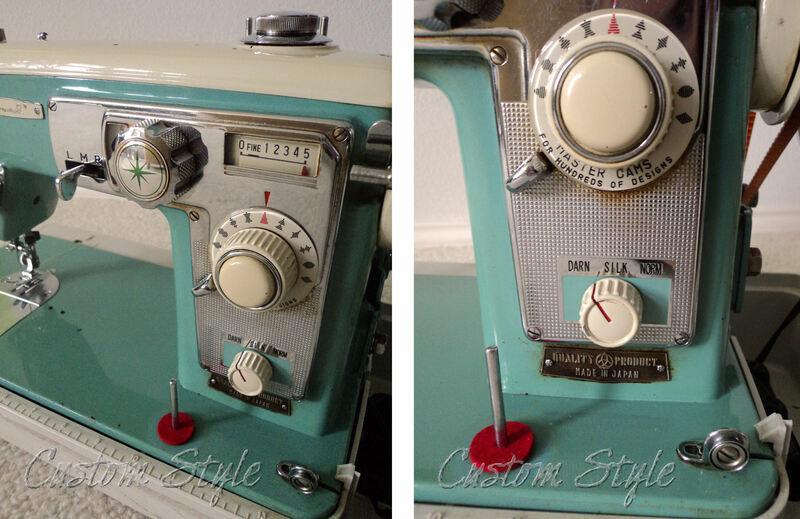 The knobs and dials resemble an old radio that belongs in the dashboard of such a car. I had never seen such a cool looking sewing machine! The internet didn’t give me much information about Wizard sewing machines (mainly because I didn’t know a model number), but I did manage to learn that they were made by Western Auto. No wonder the machine looks like a classic car! I printed the ads for the 6 machines with the plan to go pick up my dead machine as soon as the repair store opened in the morning and ask the repair guys a couple questions. I also wanted to see what my options were in the way of new machines that they carry there. The store I went to is a Baby Lock dealer. I’ve owned a Baby Lock serger for about 11 years and I’ve used other Baby Lock sergers in costume shops, but I’ve never used or known anyone with a Baby Lock sewing machine. So I really didn’t know what they would show me at the store. I told the sales lady what I needed and asked about the ability to repair the new machines. I learned that Baby Lock (unlike the Singer brand nowadays) is very good about continuing support of their machines – meaning, they make a real effort to keep making parts for repairs for years. Bonus points for Baby Lock! Call me old-fashioned, but I like being able to repair anything that wears out or breaks in this world full of planned obsolescence. The first machine I was shown was the model they usually sell to schools because it can do a lot and take a beating from students – the BL40A or “Grace” model. Two features turned me off immediately – Grace had a digital screen (brain!) and the reverse was a tiny little button above the needle. No matter what people say about getting used to it, I never get used to the reverse being there and I always reach to the right automatically. It’s nice that the screen will indicate which foot to use and it has a huge selection of stitches (including 5 buttonholes) but I don’t need any of those features. I like dials & levers and a regular push-and-hold reverse button. Grace reminded me of an iPod with a big round unmarked “wheel” dial and a couple little up/down buttons, kind of like volume buttons. Nope, not for me. Next! One step down is the BL30A model named “Molly”. She has normal dials, no brain, a standard push-down reverse lever, a drop-in bobbin, and a decorative orange stripe (one of my favorite colors). All-in-all, this Baby Lock model is very similar to the machine I was looking to replace. The “upgrades” it has compared to my kaput modern Singer is a one-step buttonhole and the extra lift level on the presser foot (features I’ve liked on machines I’ve used elsewhere). My only two nit-picky complaints are that it uses Class 15J bobbins (I have a drawer full of Class 66 bobbins) and it won’t sew quite as wide or as long a stitch as my dead machine. But bobbins are cheap (hel-looo, 50% off notions sale!) and I can probably live with slightly smaller stitches. I decided it wouldn’t be a bad idea to check out the vintage Wizard machine I found on Craigslist, too – it was only $65. Something about that machine was just calling to me and I couldn’t stop thinking about it. I was in love – and I hadn’t even tried to sew with it! I had to go see it, even though it was an hour drive from my house. So I called the number in the ad and made arrangements to check it out. As expected, the guy who was selling it didn’t know anything about sewing. He said the lady who had owned it had recently died (I think he picked it up at an estate sale). He just knew it was a nice looking and well-maintained vintage machine – he was fascinated to watch me thread it, hehe. I was glad I took my kit because the sewing machine didn’t have a needle! The bobbin in it was half-full of rotten thread that easily snapped when I pulled it tight. It had definitely been unused for a few years. But other than needing a good cleaning/tune-up to remove the dusty oil buildup, it was in great shape. So I wound a bobbin and moved some dials to see what was what, since there was no owner’s manual. It just needs a little tension tweaking and it’s a pretty sweet machine. (I love the feel of the hand wheel.) And it is the quietest sewing machine I have ever heard! I mean strangely quiet – I think I could sew in the same room as my sleeping husband and not disturb him! I happily handed over the cash and the seller loaded it into my car (I think it weighs over 35 pounds!) and my mom and I drove the hour trip back home. Close-up of the sewing machine’s main dials and levers. Doesn’t it look like an old car radio? I can tell that the needle plate is not original – it’s a different finish than the bobbin access door. I will definitely be replacing it again (if possible) because there are no measurement marks etched into it. Why do they even make un-etched needle plates? I like guide lines when I sew! So I decided it was best to replace my dead sewing machine with not just one, but two sewing machines. 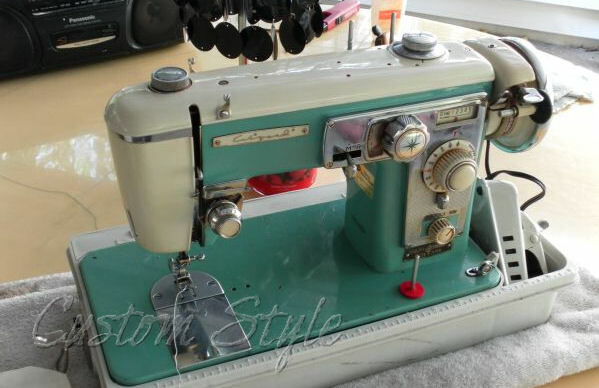 I don’t know why, but for some reason I never really named my broken machine – it was always just “my sewing machine”. 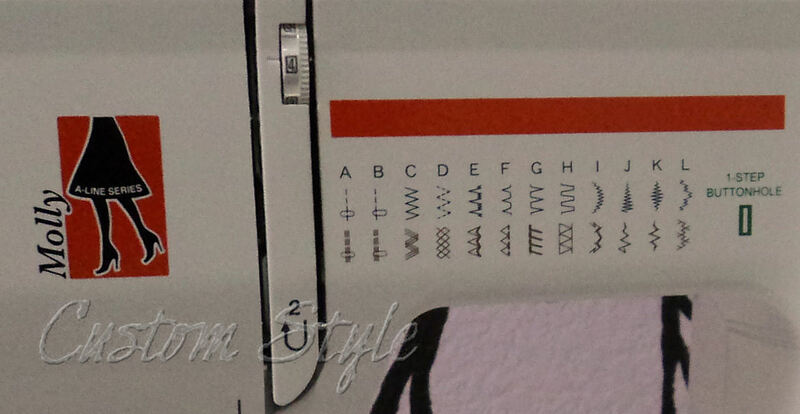 And my serger was just “my serger” (which btw, is a BL450 and basically the same thing as a BL450A or “Lauren” model aside from the different decals). I have a feeling that Gandalf will be my favorite, but Molly will be much easier to port around town for jobs and she has a pre-set for buttonholes. I think it’s the best of both worlds – old & new. * I realize the color of the machine is actually teal, but “Gandalf the Teal” just doesn’t have the same ring. Brooke, I absolutely LOVE Gandalf, and your first thoughts about it looking like a car made me laugh……. really!! I have a retro green Fiat, and my first impression was that it matches my car. I wish you happy sewing with your machines, especially the old gal (er, guy). It’s nice to know it will have a new and exciting life. There’s a costumer I work with that has a retro green Fiat – you’re right, it does match! hehe. It does look like a really cool classic car! I’ve never seen anything like it! This is the first sewing machine that I’ve seen guys ooh & aah over like a car – it’s really funny! I love the Gandalf! So jealous. Helped my mom buy a robin’s egg blue Dressmaker this summer and it looks very similar and it sounds the same way, you can barely hear it running! I told her if she isn’t using it to full capacity by the next time I visit, I am taking it home with me:-) She got hers for $50. Your mom’s machine sounds really pretty – old machines came in the coolest colors! Singer tried to come out with a new retro looking machine recently but failed miserably (it’s so ugly and looks plastic). If only machine manufacturers would figure out so many of us love the old stuff. It almost makes me want to go into the machine business, hehe. “No computer brain…” Smart idea. The computer brain gets confused and the sewing project gets ruined. Been there. But I will be going back there anyway because I miss my embroidery/sewing machine combination. Basically I just miss embroidery. But my mom has a machine from when she was a kid, the cord needs fixing so if we can find somebody to work on it we will definitely be putting that one back on the table. Yeah, I find myself fighting with the computer if the machine I’m using has one. And they all are so picky in different ways. If I were into machine embroidery, I’d probably get a separate machine just for that. my husqvarna was bought in ’75 – with a lifetime guarrantee – and it is still going strong. it has 8 stitches, reverse, and 3 different feet (foots?) – totally get your point about basic requirements. i liked your rant…because i concur with you! I think I always disappoint sales people when I buy big ticket items – I always want fewer features than most people. My general rule is buy one step (or sometimes two) up from the most basic version offered but not the fanciest. Seems to work well for everything from toasters to cell phones to sewing machines. Congrats on the new machines. I LOVE Gandalf. I learned on an old Kenmore that was the same colors. I only wish my Dad could find it again! Nothing sews as well as those old machines. They weigh a ton but they can take anything you throw at them. I do most of my sewing on a 1938 Singer 201-2. You sew on a machine like a friend of mine! It’s a nice machine! She loves it and recently learned that hers prefers some fancy German needles – she took it in to be serviced because it was cutting the thread, and all it needed was a better needle. I’ve seen that Wizard up close and it would be really cool to drive it down Route 66. Just kiddin. I would like to have a 57 Chevy Belair in those colors. I’ll definitely be looking out for Wizards from now on… Enjoy your new machines!! Thanks! I can’t wait for my movie job to be over so I can really sit down for some fun sewing on them. So far, all the sewing I’ve really done is a couple fast work alterations on the Molly machine. Oh man, Gandalf looks absolutely smashing! How fun to sew on something that looks like a vintage car! And I’m pleased to hear about Molly as well, as I’ll eventually want to replace my sad Brother. I’m totally with you about the no-brain bit. I want to be the one thinking, not the machine! I’ve used a few computerized machines that have bobbin sensors – something that sounds like a wonderful idea but really isn’t. When a bobbin was low, the machine would completely STOP sewing and make you clear the screen or choose to backstitch and wind a new one. And the sensors are usually set to go off way too early when you still have lots of thread left so you have to keep clearing the screen. I always fight the computer. So far, I’ve only really sewn on the Molly (I brought home a few work alterations) but it’s a really decent little machine. I can’t wait to use Gandalf – I had him cleaned & serviced and got him back two days before getting sucked into movieland. My husband (classic car buff) loves your Gandalf! When I showed him the photo, he knew immediately when he saw the name that it was made by Western Auto as they used to make a variety household appliances named Wizard. (Besides old cars, he also loves old appliances–ask me about the two 1950’s ovens in our garage. They still work and come in handy at Thanksgiving.) Had to laugh when I saw your photo of the Genie. I have my original one down in the garage…still works. Happy sewing on your classic! I’ve been in a house that still had all the original 50’s patterned counters, metal cabinets and also a double oven – so cool! How fun that you are still using yours! I inherited the BROTHER version of Gandalf a month or so ago. I’ve just begun researching the machine and came across your site by chance. Same exact machine but with BROTHER on nameplate instead of Wizard. The first comment I made to my wife was that I wish we could take it for a cruise. 🙂 Gorgeous piece of machinery. There is very little information about the machine, but the tag says it was made in Nagoya, Japan by Nippon Sewing Machine MFG. Co. LTD.
Is yours a pink model 210 by chance?? I have managed to piece together a bunch of information over the last few weeks, and I have a post in my draft folder all about the interesting things I’ve discovered about my machine – hoping to post it tomorrow (I just have to take a couple photos first). How ironic that you would leave a comment just before I was able to get more information up! Thank you so much for commenting! No, our machine it the same green/teal color as yours. I can’t wait to read what you’ve discovered. My wife is the seamstress and uses a Janome, but is excited at the thought of using the vintage BROTHER. It looks to be used very little and came with a nifty little table (pretty mod looking), but we haven’t tried it out yet. Interesting – I must be correct in my guess that my model is the last made under the Wizard brand name! Here’s the post about everything I’ve learned so far. These are good looking machines! My first plan of attack is to look at the new Janomes and see what looks good in my price range. Then, if that doesn’t go well, I’m going to look on the online selling forums and see about getting a good, sturdy vintage model. Good luck with your machine shopping! I have a Janome mini that’s about 3/4 size for a travel/emergency machine. One of my coworkers has the teal Hello Kitty one from Target – he says it make a really nice buttonhole. I’m not completely sure, but I think Janome might somehow be related to Baby Lock because a lot of things look really similar between the brands on the outside. Your Baby Lock sounds like an excellent machine. I’ll have to see if there’s a place locally where I can test one out. Love your vintage model – looks really cool! Oh, nice! Hope you find the perfect machine for you!